Rope fish ( Erpetoichthys calabaricus) is a slender fish that resides in the muddy rivers and streams of tropical Africa. Known for his docile temperament, the rope fish has many distinct physical characteristics. Some of his most striking features include an elongated eel-like shape, thick bony scales and nostrils on tentacles that extend from his flattened head, according to the University of Michigan Department of Zoology. Although the rope fish is most active during the night, he'll occasionally emerge into the open during the daytime. Rope fish can grow up to 16 inches long, so require spacious tanks. 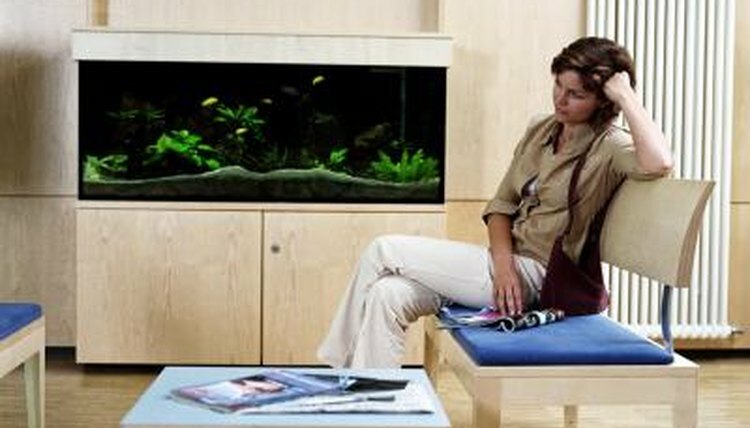 A 45- to 55-gallon tank is adequate for rope fish up to 12 inches long, but a more spacious tank will be needed for larger fish. Your rope fish requires plenty of hiding places to feel safe and secure, so the tank should be planted with rock work, deep-rooted plants and driftwood. Avoid over-planting -- be sure to leave some open swimming areas. The snake-like rope fish tends to slither along the bottom of the tank, so use fine gravel or sand for the substrate. While the rope fish is a freshwater species, the addition of some sea salt can be beneficial. Maintain the water temperature between 72 to 82 Fahrenheit. Due to poor vision, the rope fish depends on his keen sense of smell to locate food. The species is carnivorous, and in their natural environment dine on insects, worms, small fish, frogs and crustaceans. In captivity, you can feed your rope fish meaty live or frozen foods, such as prawns, chopped meats, insect larva, earthworms, mussel and live blood worms (a rope fish favorite). Most rope fish have been removed from their natural habitat where they're accustomed to consuming live foods. For that reason, if your rope fish is initially reluctant to eat frozen or dried foods, be patient -- in time he'll adjust to eating them. While the rope fish might seem reserved, preferring to hide among rocks and driftwood, only emerging after dark, he actually is a social fish. You can include other medium to large-sized species in his tank, as long as they're not an aggressive species. However, rope fish typically prefer the companionship of other rope fish, and up to six fish can peacefully cohabit the same tank. Rope fish are not generally territorial. They can be seen congregating and hiding together as a group when housed in the same tank. The rope fish is a talented escape artist. Their slender body shape allows them to be extremely agile and slither out of tanks through even tiny holes and openings. You can prevent your rope fish from escaping his tank by keeping it tightly covered with a secure fitting lid without any holes. If your rope fish does manage to escape his tank, he can survive for a short period out of water, due to his modified swim bladder that he uses like a pair of lungs. His modified swim bladder evolved so the species could survive in waters with low oxygenation.